Andrei Sakharov was a prominent Soviet physicist who was a major contributor to the development of atomic technology in the Soviet Union. In later life, he became a peace activist and was awarded the Nobel Peace Prize in recognition of his efforts. Sakharov was born in Moscow in May 1921 to a large, close knit family. His father was a physics teacher and would often take Sakharov into his laboratory. This greatly influenced his decision to study physics and he began performing experiments at a young age. Sakharov often fondly recalled his childhood days spent surrounded by family, living together in a large compound. One of the most profound influences in his life had been his grandmother who read the works of classic literature such as Shakespeare and Dickens aloud to the children, which helped to develop his taste in literature. He also quotes his father as another positive influence, who was a remarkable pianist along with being a scientist and author. Sakharov graduated from high school with distinction, then went to Moscow University to study physics, where he also graduated with distinction. He worked as an engineer at a military factory during World War II, where he met his future wife, Klavdia Vikhireva. After the war, Sakharov began his Ph.D. at the Lebedev Physical Institute of the Russian Academy of Sciences which he completed in 1947. There he was taught by the theoretical physicist Igor Evgenyevich Tamm, who later won the Nobel Prize in physics. Sakharov joined a research group that was working on atomic weapons. Between 1950 and 1968, Sakharov worked at top secret research facilities and helped to develop thermonuclear weapons. His research later led to the development of the first hydrogen bomb produced by Russia, which is why Sakharov is sometimes referred to as the “father of the atomic bomb”. He was elected to the Soviet Academy of Sciences in 1953, at the age of 32, which made him the youngest member to be elected. He also received three “Hero of Socialist Labor” titles in 1953, 1956, and 1962. While working to develop nuclear weapons, Sakharov had a strong sense of dread at the consequences of the use of nuclear weaponry. He wrote many letters of protest to the Soviet government against the testing of the hydrogen bomb in 1961. He was also involved in the Partial Ban Treaty signed in 1963. His ideas in this regard were published in his most famous article titled “Progress, Peaceful Coexistence and Intellectual Freedom” in 1968 in which he urged the end of the arms race. It was largely ignored in the Soviet press but received worldwide acclaim and recognition. He was concerned with civil rights violations and often took part in protests against the arrest of political activists. At one of these meetings, he met his second wife named Elena Bonner. Sakharov was then a widower and Bonner was an activist and a great supporter of Sakharov’s work. 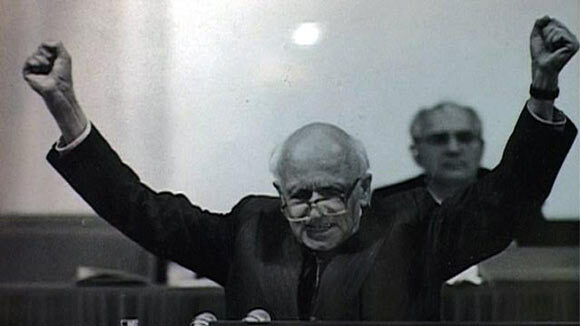 For some time, Andrei Sakharov was immune to harassment by the Soviet government due to his international standing in the scientific community. However, he was gradually removed from involvement in all major projects and eventually he and his wife were banished to the city of Gorky, 250 miles from Moscow. They were denied permission to contact their friends and relatives and were frequently harassed by KGB, the secret Soviet police. In 1975, he was awarded the Nobel Peace Prize for his work as a pacifist and efforts to bring about the end of the arms race. After seven years of banishment, the Russian prime minister Mikhail Gorbachev ordered his release in 1986. He spent his remaining life travelling. In 1989, he was elected to the Soviet legislature and died the same year at the age of 68.